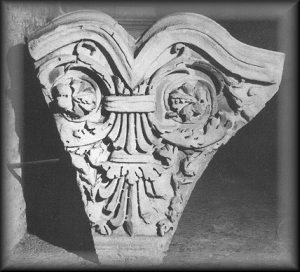 have discovered that from as early as the IV century materials were taken away from the Colosseum, and that some drains were obstructed by the end of the same century. At the beginning of the V century the water/drainage system, at least in the south western sector, had stopped working, as the lead piping and fountains had been removed. Among the last repairs to the Colosseum - dating back to 484 or 508 - are the ones that the Praefectus Urbi Decius Marius Venantius Basilius had ordered - at his own expense: repairs to the arena and podium, damaged by an "abominandus" earthquake. Venantius' repairs of the arena simply meant dismantling the remaining colonnade and sliding the columns and pieces down in the underground of the arena and filling it up with earth. In fact, when archaeologist Carlo Fea excavated the arena in 1810-14, he found three roads on top of each other, along the long axis. The oldest one had been built where Venantius had filled up. Later on, in 1874-75, P. Rosa started the main work on the oldest stratum of earth - dating back to Venantius' days - and found 70% of the columns of the upper portico, a quantity of inscriptions, the fittings of the vomitoria, blocks of travertine and tuff, wooden beams and parts of the underground machinery. There were the ruins of at least 20 huge columns (together with the capitals) that had fallen down from the top portico and had damaged the cavea mainly in the NE-SE sectors. This proved that after the ruinous earthquake the hypogea, which until then had still been working, were considered lost and buried for good under a layer of earth, and hadn't been disturbed for about 1.300 years. Though the amphitheatre was still in use at the beginning of the VI century, it was now oversized for the reduced population of the city, so the Romans started recycling its materials: travertine was there in abundance, and it could be used as it was or calcined to make lime. Everything was recycled: the thick marble slabs that lined the walls, tuff blocks, the lead of the piping, the metal grips that kept the travertine blocks together, even the bricks. This spoliation started during the reign of Theodoric (454 – 526) and it was systematic: unused or damaged parts of the building were dismantled and reused. 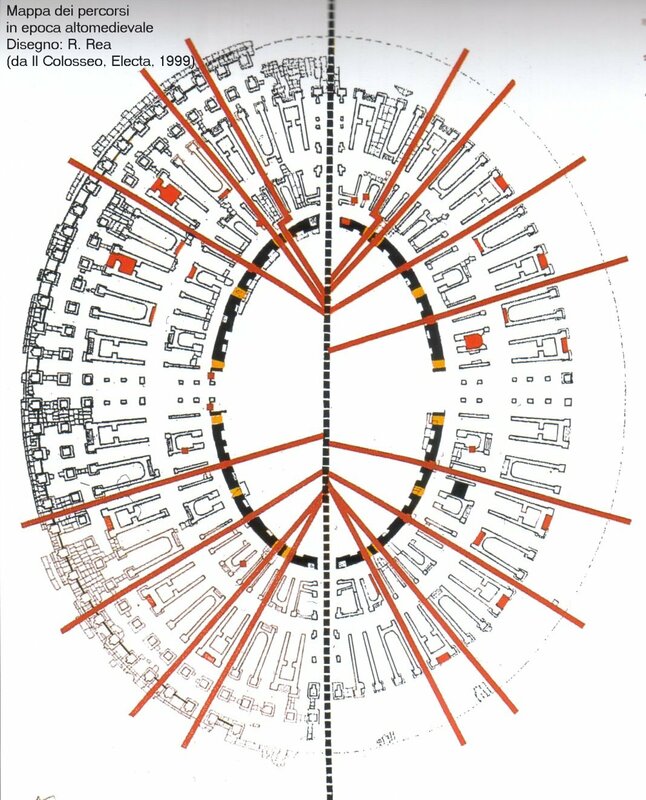 We have very few literary or epigraphic sources for the centuries VI-IX, so the archaeologists had to understand what had happened to the Colosseum by investigating the traces left in the amphitheatre. In those times the only stable institution was the Church, and it was Pope Gregory I the Great (590-604) who introduced the practice of recycling ancient temples, buildings and halls and turning them into Christian churches. 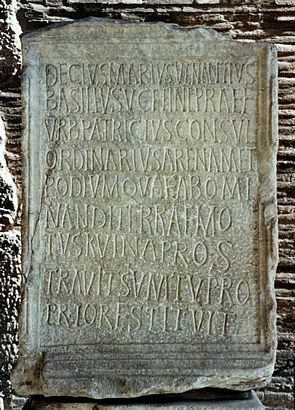 Evidence of this apparently comes from a name carved on a pillar on the SE side: "GERONTI V S". 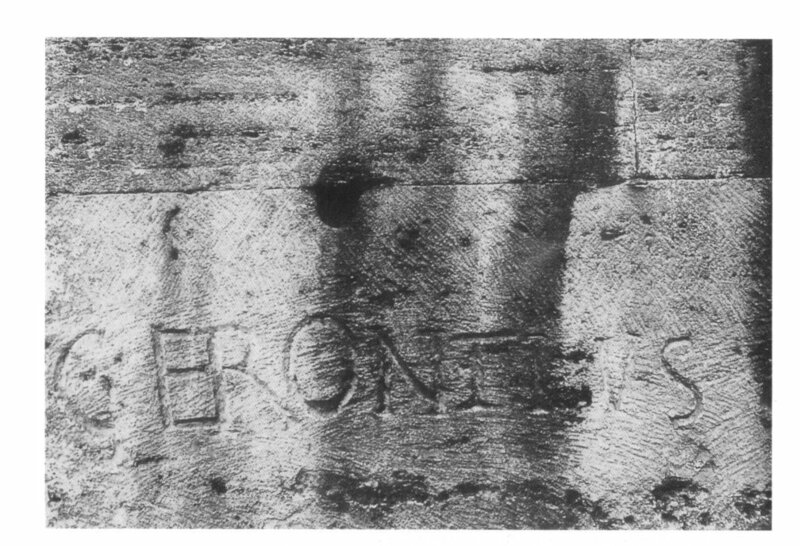 This name has been interpreted as belonging to one important Gerontius (V S means VIRI SPECTABILIS) who had permission to dismantle the structure and use the Colosseum as a quarry. Nevertheless the amphitheatre was still in use: in 519 Eutaricus Cilica (supposedly Theoderic's son in law) and in 523 Anicius Maximus celebrated their consulships with venationes in a Colosseum which no longer had the upper portico or underground, not to mention other major damages to the cavea, entrances, etc. In any case the venationes by Anicius were the last ones. Theodoric had given permission to Anicius Maximus to celebrate his consulate, but at the same time had defined the games "actus detestabilis, certamen infelix" and blamed Titus for having spent all that money in a building destined to celebrate death. During his reign, the area was reclaimed, and a road was built level with the arena to connect the Celian hill to the Colosseum. The valley of the Colosseum started to fill up with earth, as the drains had stopped being maintained. 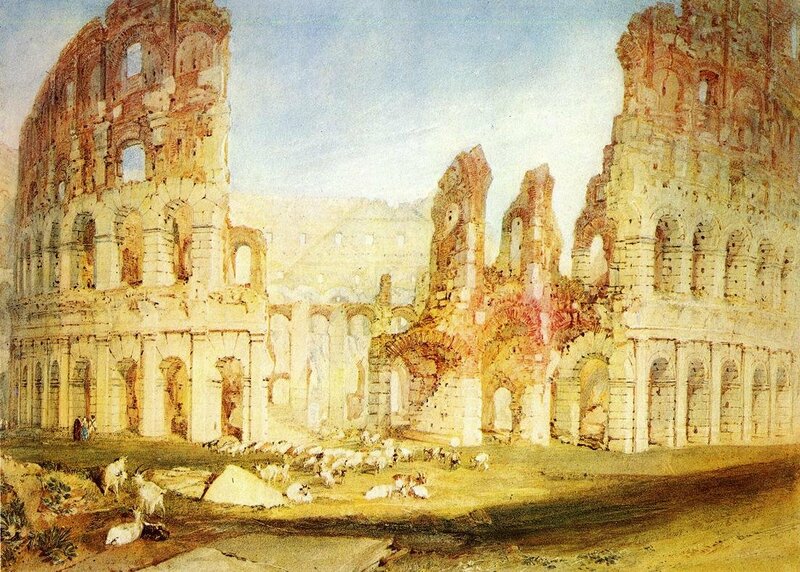 During the Gothic War (535-553) the city was repeatedly starved and sacked by the Ostrogoths, led by king Totila. Historians report that when Totila entered Rome in 545 there were only 500 people left, and it was probably during the Gothic War that most of the metal grips holding the travertine blocks together were systematically removed. It seems that for some time the amphitheatre was closed by wooden barriers, but it is uncertain whether it was a closure before a possible reopening or to defend a property. Later on these wooden gates were removed, the Northern outer ground floor corridor became a sheltered path, an alternative to the main road through the axis of the amphitheatre, and the inner corridors were turned into houses and stables. The easiest way to gain access to the arena with the carts was by the paths once reserved for the senators as they led directly from the outside to the arena, so some openings were made in the walls facing the arena (see map), leading us to think that the place had become a kind of piazza along the only road between the Colosseum and the Celian hill. Many staircases were demolished, and the building was divided into sectors. From the VI to the IX century this occupation of the amphitheatre was constant, except for some periods in which the pillaging and extraction of materials prevailed. Between the VI and the XIII century the ground floor rose by 1,3 metres. During recent excavations this old layer was found still intact under one of the staircases. It had been overlooked by all "cleanings" until now. There were pieces of pottery dating to the XII-XIII centuries. Other corridors were thoroughly investigated, founding traces of medieval use: walls, a basin to prepare lime and traces of the use as stables. By the end of the VI century the city had by now lost its importance and its population because of the repeated invasions and looting of Italy. Now Rome counted only 90.000 citizens: it had become a little city concentrated in a small nucleus, surrounded by fields, orchards, ruins and farms, and this situation lasted up to about the end of the nineteenth century. The Colosseum remained outside the centre of the medieval city, which was concentrated on the banks of the river. Further earthquakes in 801 and 847 probably made more damage. The amphitheatre started being overgrown by plants and trees, and there are even stories about wild animals  even wolves  roaming the site. The ground level had slowly risen over the centuries, thus submerging a good half of the ground floor arches. During the illiterate Middle Ages, all recollection of the purpose of the amphitheatre had gone lost, and people started to imagine that the building had been a temple dedicated to the Sun God, or to the devil. 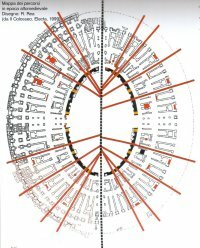 In this period the guidebooks for the pilgrims visiting Rome generally described the Colosseum as a round temple, dedicated to different gods, that had once been covered by a dome made of bronze - or maybe copper. It was in this period that many legends started to circulate about the massive round building, saying that it was a palace of Titus and Vespasian, a temple of demons, a seat of occultism ... and more. 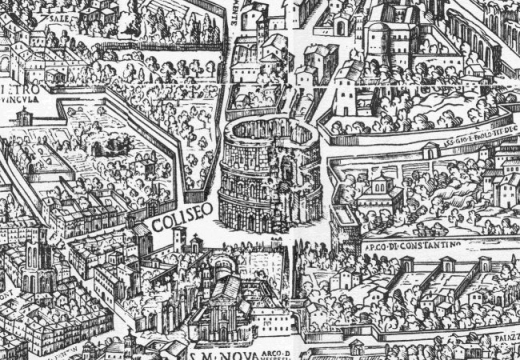 Between the end of the IX century and the beginning of the X there was a great development of the Colosseum "residences". The building now belonged to the church of Santa Maria Nova, and we still have the notarial documents that record sales and rent of the houses inside the building. It was in this period that the amphitheatre started to be called Amphitheatrum Coliseum. There were houses on one or two floors (domus solaratae) sometimes with an orchard, a little yard and a chimney. The number of houses increased so much that in the end there was a row of them against the Northern side, like a terraced street of modern cities. The traces of these houses can still clearly be seen on the stones of the ground floor arches. The maximum expansion was reached around year 1200. The inhabitants were mainly artisans: smiths, cobblers, bricklayers, cart makers, lime makers. In this period the moneychangers were concentrated in this area too, perhaps because the pilgrims went through it to reach the Lateran (the Pope lived there), so that the area was called contrada cambiatorum. In 1084 an army of 36.000 Normans led by Robert Guiscard sacked Rome and devastated the areas between the Lateran and the Colosseum. The city fell into the hands of baronial families who were at constant war and lived in tall towers for safety reasons (a few of these towers are still standing as a reminder of the quarrelsome Middle Ages). One of the strongest families, the Frangipane, occupied the Colosseum, which was transformed into a house/fortress, and walled a large area around it: Palatine, Circus Maximus, and for some time even the Torre delle Milizie ("Tower of the Militia") near the Trajan's Market in the Imperial forums. The Frangipane palace in the Colosseum occupied two floors on the eastern side; between the end of the XI century and the beginning of the XIII it coexisted with other houses built in the part of the monument belonging to the church of Santa Maria Nova. In 1144 the Roman people banned the baronial families from the city, in an effort to free Rome from the influence of the Pope and of the nobility and to establish a Senate like that of the ancient Romans. The Colosseum was then occupied and declared a property of the free municipality of Rome. However, in 1159 the Frangipane came back and reoccupied the building. In 1216 the Annibaldi family challenged the Frangipane for the possession of the fortress, and the struggle lasted till about the end of the century, when the Annibaldi took over the Colosseum, but were obliged to return it to the Church in 1312. There is mention of a bullfight, organized in 1332, in which 18 youths of the Roman nobility are said to have lost their lives, but the truth of the story is uncertain (Delehaye, entry: Colosseum, in Catholic Encyclopedia). In 1231 part of the SW wall had collapsed during a very violent earthquake, but the "big one" took place in 1349. 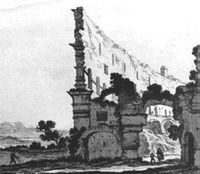 It damaged the city extensively and destroyed other external arches on the Southern side. This event is reported in a letter of the poet Francesco Petrarca. The huge mass of rubble was called "coxa Colisei", the "thigh of the Colosseum" and it was used as a travertine quarry until the XVIII century. In the XIV century the Orsini and Colonna families were granted permission to remove stones and marble. In 1362 Gil Álvarez Carrillo de Albornoz, bishop of Orvieto, lamented in a letter to the Pope Urban V that there weren't any buyers for the stones of the Colosseum, and that only the Frangipane had ordered some marble to build a palace. Because of never-ending feuds among the Roman families and the conflict between the Papacy and the French crown, Pope Clement V left Rome for Avignon in France. Seven Popes resided in Avignon (the so-called Avignon Papacy) from 1309 to 1377. During this period the economy of the city collapsed, and at the end of the XIV century the population had declined to 17.000 (at the peak of its imperial expansion Rome counted 1 million inhabitants or more). The area once again became a den of criminals, a dangerous and violent place. At this point the Senate of Rome decided to reclaim the site and gave this task to the religious association "Arciconfraternita del SS. 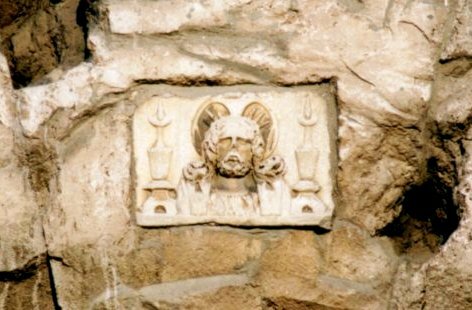 Salvatore ad Sancta Sanctorum", that already owned the old Frangipane palace. It was a group of distinguished and pious citizens who sponsored a hospital near the Lateran and some schools in Rome. The association was so efficient in its task that in 1382 it was bestowed one third of the building. Another third belonged to the Camera Apostolica (the central finance department of the Popes) and the remaining third to the Roman Senate. There are still traces of the stones slabs affixed on the pillars of the amphitheatre to mark the property, so it has been possible to understand that the properties were fragmented all over the amphitheatre. In 1439 the Colosseum travertine was used to build the tribune of St. John's Lateran. It was then that the removal of marble, stones and bricks really started, and it lasted for generations. Many palaces and churches were built with stones taken from the Colosseum. It is reported (Lugli) that, in the year 1451-1452 alone, 2.522 cartloads were taken from the site to be used for buildings of the Vatican and for the walls of Rome. It is a sad contradiction that just when the Renaissance humanists had understood the value of Roman heritage, the pillage assumed bigger proportions, and that the very monument that was being destroyed had inspired the architects who were using the old stones to build new palaces. 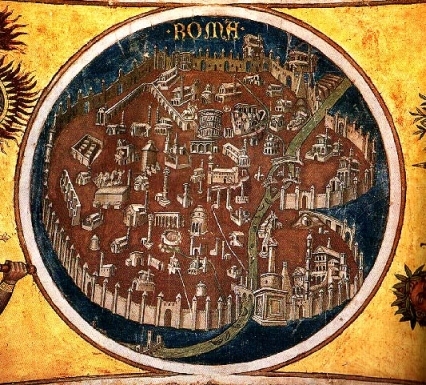 A map of Rome by Taddeo di Bartolo. The fresco was painted in Siena in 1407. Tourism then did not exist, and people traveled for business or pilgrimages. 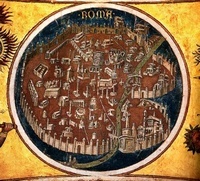 The map reports only the main landmarks: churches, columns, arches, aqueducts etc.